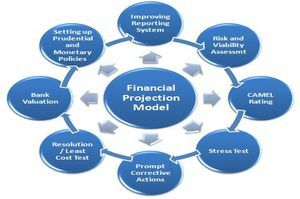 What keeps Projections from just being a number-crunching exercise? 1. First, the financial plan translates your company's goals into specific targets. It clearly defines what a successfully outcome entails. The plan isn't merely a prediction; it implies a commitment to making the targeted results happen and establishes milestones for gauging progress. 2. Second, the plan provides you with a vital feedback-and-control tool. Variances from projections provide early warning of problems. And when variances occur, the plan can provide a framework for determining the financial impact and the effects of various corrective actions. 3. Third, the plan can anticipate problems. If rapid growth creates a cash shortage due to investment in receivables and inventory, the forecast should show this. If next year's projections depend on certain milestones this year, the assumptions should spell this out.